Spend the day exploring the 24-hectare resort, swimming by the beach or lounging by your cottage! Thank you KLOOk for a once in a lifetime experience in Maldives of Batangas I have gain new friends in joining tour. 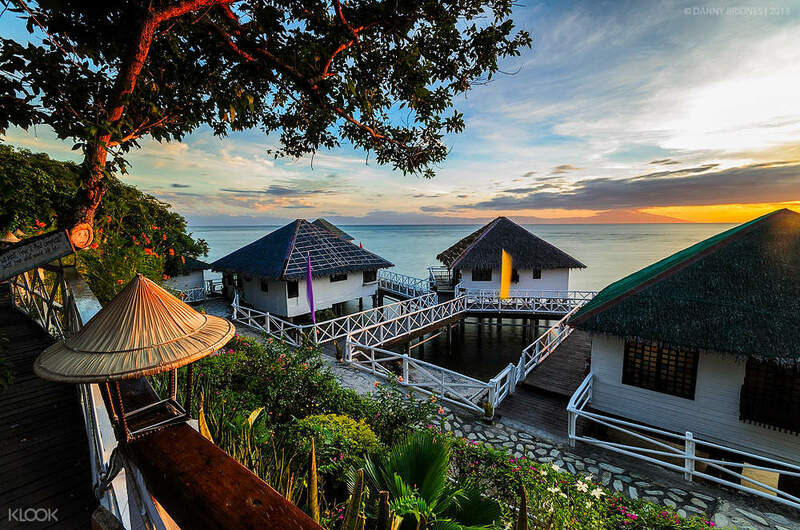 Leave the city noise behind as you travel to the Stilts Calatagan Resort boasting stunning sandy beaches and charming little wooden cottages on stilts. Often called “the Maldives of the Philippines”, Calatagan is the country’s best kept hidden paradise. Just 3 hours away from the busy capital, the resort offers the much needed getaway in the best of tropical traditions. Set off early in the morning, have a quick breakfast on the road and arrive at Calatagan by 7am. Cool down with a relaxing swim and work up an appetite — a delicious lunch on the beach awaits! Enjoy some free time on the beach before heading back to Manila. Please refer to the activity rates beforehand to plan out your day! The driver and the coordinator could both speak good English. They arrived at the meeting location much earlier, together with 2 nice filipino ladies in the van. My friends from Indonesia and myself (Singapore) found it easy to contact them and the drive to and fro was pleasant. We had a pitstop for breakfast, which was a much needed break to stretch the legs. The place was nice and we enjoyed ourselves. Tried the activities available (paid on our own separately) and the food at the restaurant was pretty good. Thanks for everything!! The driver and the coordinator could both speak good English. They arrived at the meeting location much earlier, together with 2 nice filipino ladies in the van. My friends from Indonesia and myself (Singapore) found it easy to contact them and the drive to and fro was pleasant. We had a pitstop for breakfast, which was a much needed break to stretch the legs. The place was nice and we enjoyed ourselves. Tried the activities available (paid on our own separately) and the food at the restaurant was pretty good. Thanks for everything!! It was an amazing experience. The driver and host was so nice and friendly. They were communicative. We had stopped for breakfast and enjoyed the coolness of tagatay. The beach was nice and you can bathe or swim, the water is not so deep so its good for children and for those who can't swim just bathe. There are also swimming pools for those who wants to swim. There are a lot of activities you can do with a reasonable price. We went Kayaking, and then played the ATVs. Even though it rained here and there, it didnt stop us to have good fun. Thank you Klook! It was an enjoyable trip and it is worth to go again for relaxing. It was an amazing experience. The driver and host was so nice and friendly. They were communicative. We had stopped for breakfast and enjoyed the coolness of tagatay. The beach was nice and you can bathe or swim, the water is not so deep so its good for children and for those who can't swim just bathe. There are also swimming pools for those who wants to swim. There are a lot of activities you can do with a reasonable price. We went Kayaking, and then played the ATVs. Even though it rained here and there, it didnt stop us to have good fun. Thank you Klook! It was an enjoyable trip and it is worth to go again for relaxing. The driver is kind enough to handle everything and take everything under control. Travel time is fast and I really commend the driver! The place itself, maybe it's the time of the year where the water gets murky and lots of seaweed are on shore but the staff do their best to clean it right away. Lots of activities to do and the food there is soooo good. The driver is kind enough to handle everything and take everything under control. Travel time is fast and I really commend the driver! The place itself, maybe it's the time of the year where the water gets murky and lots of seaweed are on shore but the staff do their best to clean it right away. Lots of activities to do and the food there is soooo good. it was worth the price and i had a fun day here! only downside is they never sent a message re van and driver details so i was worried. other than that, it was a very easy transaction. will def book more with Klook! it was worth the price and i had a fun day here! only downside is they never sent a message re van and driver details so i was worried. other than that, it was a very easy transaction. will def book more with Klook! The place looks amazing! I enjoyed biking around the whole place. There are lots of fish around the sea that you don't even have to go snorkeling to see them. Food is also nice and priced right! :) Hope Klook can offer overnight packages as well! The place looks amazing! I enjoyed biking around the whole place. There are lots of fish around the sea that you don't even have to go snorkeling to see them. Food is also nice and priced right! :) Hope Klook can offer overnight packages as well! Thank you KLOOk for a once in a lifetime experience in Maldives of Batangas I have gain new friends in joining tour. Thank you KLOOk for a once in a lifetime experience in Maldives of Batangas I have gain new friends in joining tour. Driver is very accommodating. Place was nice to relax. My son enjoy the beautiful place. Driver is very accommodating. Place was nice to relax. My son enjoy the beautiful place.